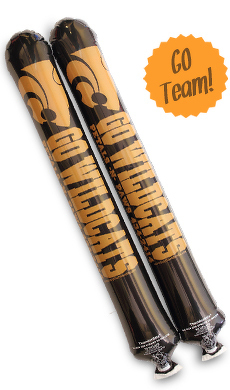 • Creative basketball noisemakers produce the same loud effect as all our other custom thunderstix and look great too! Distribute to those around your for maximum noisemaking. • Imprint your favorite basketball team's logo and name to show off your pride. personalized noisemakers are also ideal for businesses looking for effective and inexpensive promotional logo inflatables . Imprint your logo and information with the help of our specialists! • Designed for 24" x 4.25" basketball noisemakers and made with our long-lasting, premium material. Sold in pairs of two.